Amethyst is the traditional birthstone for the month of February. Iron impurities in quartz give amethyst its wonderful purples-from pale lilac to royal. Tree of turquoise chips with sterling silver and copper. To me it’s such a summery color. I guess on the right winter day you can have a turquoise sky brilliant against the snow and bare trees. Turquoise supposedly gets its name from the middle French for Turkey, since the trade routes that first brought turquoise to Europe came through that country. It’s an opaque stone with a texture somewhere between waxy and glassy. It takes polishing well but is relatively soft. (Mohs 5-6) The color can change with exposure to cosmetics, oil, sweat and detergents as well as bright light. Turquoise seems to be another of those stones that is popular for rings but probably shouldn’t be used for them! At least take them off before washing your hands. Turquoise is a secondary mineral; it forms when acid solutions leech elements from other minerals. It doesn’t have a crystal shape, so tends to form clusters or nodules in veins and often grows with other copper related minerals. (For example, chrysocolla or malachite. Great color combinations.) The blue in turquoise comes from the copper, and the green hints from iron and chromium. In the states we tend to associate turquoise with the Southwest. In a lot of places it’s a lucrative secondary to copper mining. Apparently the classic Southwestern silver and turquoise jewelry is a fairly modern phenomenon. Supposedly the concept was pushed by traders in the 1880s. Before then Native Americans used turquoise in solid beads, mosaics and carving rather than settings. Some of the turquoise minded in the southwest is still gem quality (especially the Sleeping Beauty and Kingman mines), but a lot of it is treated to get it stable enough to use. It’s kind of frustrating, because it is hard to tell if material sold has been dyed or stabilized with plastics or epoxy. On the plus side, it has also led more recently to a type of stabilizing/reconstituting that adds brass or copper veining through the stone. It doesn’t make any pretense at being natural and is a lot of fun to work with! The best imitation is called Gilson turquoise. It has both uniform color and veined variants. The most common way to fake turquoise is to dye naturally white stones that possess similar textures (and veining patterns). Value for turquoise seems to be very much in the eye of the beholder. Some hold out for the most turquoise of the turquoises with very uniform color-the best quality of this type comes from Iran and is the most desirable in the middle east and much western jewelry. Others prefer the stone to have a cob webbing of matrix when the pattern and color is complimentary, emphasizing the richness of the color. This is the type generally preferred by artists in the Far East as well as by many Southwestern artists. Oh, and apparently there’s a Turquoise Museum in Albuquerque, NM. Who Knew? I fell for jacaranda trees when I saw them live for the first time this Spring. They belong in more tropical climes then I do, so I’d only seen them in pictures. so beautiful and strong, I am the Jacaranda tree. When I got home I started puttering with colors to make a jacaranda tree pendant. Alone the tanzanite looked a little too cold, so I mixed in amethyst for warmth, added labradorite for a flash of blue and peridot for a hint of greenery. I think the tanzanite still firmly holds center stage though! Tanzanite is a rare blue/purple/violet gem only found in Tanzania. (Generally it looks more sapphire blue in natural light and more purple in artificial light.) It’s actually much rarer than diamond. 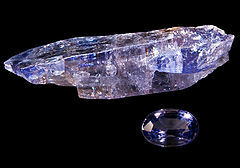 Tanzanite is a blue form of zoisite. In 1967 miners discovered some beautiful translucent violet stones while mining for graphite. It gained its trade name of Tanzanite from a marketing campaign by Tiffany & Co. They wanted to emphasize its rarity didn’t think it would sell under the name blue zoisite. After the first bout of blue stones the trail ran out. All miners found were russet and khaki colored zoisites. They sent samples for study to the same German company that had handled the original gems. The samples were tested, and it was discovered that heating those brown stones to over 700 degrees got rid of the browns and yellows and turned them into the striking blues. At this point it is pretty much assumed that any tanzanite on the market has been heat treated. Since this is a known practice, it isn’t considered a cheat.